Grilled tuna Nicoise salad is a good meal for this time of year. It’s flavorful yet light. It’s a dish I could easily tuck into on a warm evening on the patio. Grilled tuna Nicoise takes the traditional Nicoise salad up a notch. Fresh tuna steaks are substituted for canned tuna. Celebrity types from Wolfgang Puck to Ina Garten (the Barefoot Contessa) have their own versions of grilled tuna Nicoise. Like the traditional Nicoise salad, many of these recipes use hard-boiled eggs, olives, green beans, and tomatoes. Corporate chef and cooking instructor Karin Calloway offers a seasonal take: She uses grilled asparagus instead of green beans. The steaks are marinated in a lemon-infused vinaigrette, and then grilled. The asparagus and new potatoes are tossed or brushed with extra virgin olive oil and grilled, too. 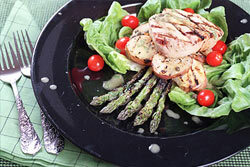 The grilled tuna, asparagus and potatoes are then set atop mixed greens and cherry tomatoes. The dish is brought together with a dressing made from some of the vinaigrette that’s been set aside, capers, and chopped fresh basil. “This is a simple and satisfying spring meal that also would be wonderful for al-fresco dining and outdoor grilling this summer,” says Calloway, who developed the dish for Viking Range. Makes me want to head outside and fire up the grill.